The RSU is an auto-transformer designed to handle the high powers produced using RITEC gated amplifiers. It is useful when using high impedance loads such as some piezoelectric transducers. The voltage step-up ratio is selected as 1:2 or 1:3 (impedance ratio 1:4 or 1:9). 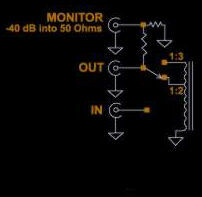 A monitor output is provided to examine the output without damaging the oscilloscope input. The factory should be consulted to establish the desired frequency range.